It Seems Vladamir Putin's Weakness Has Been Found..
Over the weekend a video resurfaced of the time Vladamir Putin had a meeting with the president of Turkmenistan, Gurbanguly Berdimuhamedow. During the meeting, Berdimuhamedow bizarrely gifted Putin a puppy. 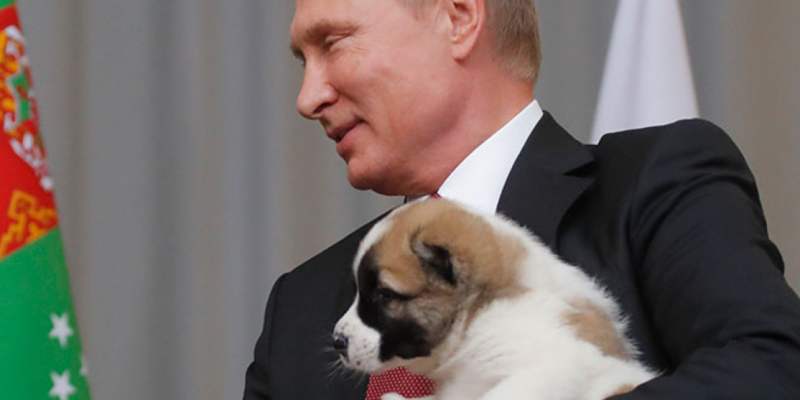 An already weird series of events got even weirder when Putin came out looking like a harmless, puppy loving gentleman. As the Rubberbandits put it, it's quite apparent the president of Turkmenistan has never held a puppy in his life. President Berdimuhamedow presented the puppy while holding him by the scruff of the neck and although the puppy didn't seem to be in pain, it still prompted President Putin to step in and gently cradle the pup. I mean at least we now know how to stop Putin?